Like many Canadians, Philippe Hudon has been playing hockey since the moment he learned to walk. Unlike most children, however, Hudon was very neat and organized. “His room was always impeccable. I was never complaining [about] that actually,” said his mother, Ann-Julie Lebeuf. 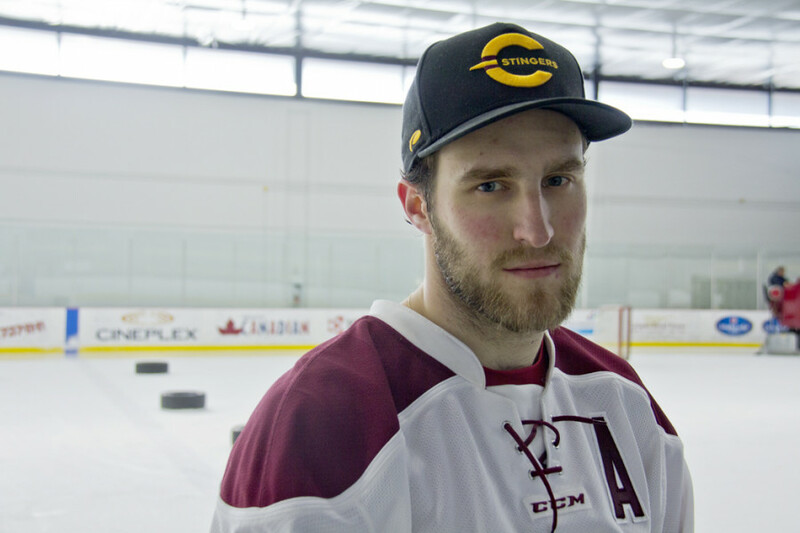 In December of 2010, the Stingers assistant captain was diagnosed with obsessive-compulsive disorder, also known as OCD. This disorder is characterized by a desire to relieve distress by performing anxiety-reducing acts to appease subjective stressors. Because the individual feels less anxious after performing the act, the behaviour becomes reinforced and is eventually performed reflexively. OCD encompasses a variety of obsessions and behaviours. For instance, some people have an urge to compulsively wash their hands to reduce their anxiety over germs. For Hudon, perfectionism was the focal point of his disorder. The year 2010 was full of promise for Hudon prior to his diagnosis. At the time, he was attending prep school in Connecticut. He was a straight-A student and received attention from several universities, including a scholarship offer to Cornell University in New York. On top of it all, he was eligible for the 2011 National Hockey League draft, where young hockey players are selected by 30 NHL teams and are given the opportunity to fulfill their dreams of becoming professional hockey players. Things seemed to be going well, and, more importantly, according to plan. Then, his life took a sudden turn for the worse. The pressure he put on himself to maintain his grades became unbearable. His perfectionist tendencies began to take control of his life. Eventually, it came to a point where he couldn’t hide it anymore. Hudon was drafted in the fifth round—the 145th pick of the draft—by the Detroit Red Wings the following year, and enrolled in Cornell University to play hockey. He only completed a month at Cornell before returning home to Montreal. Hudon began seeing his psychologist two to three times per week and was taking prescription medication for his OCD. For escape, Hudon turned towards his one true passion: hockey. He joined the Victoriaville Tigres in the Quebec Major Junior Hockey League. Hockey became his safe haven, a home away from home and an oasis from his worries. It was during this time that he was approached by French sports television channel Réseau des sports for an interview regarding his OCD for the Bell Let’s Talk campaign, which aims to raise awareness of mental health. For the first time, his issue was made public. Soon, he saw the impact of his actions on the lives of others battling mental illness. Now at 95 per cent of his recovery, Hudon is still carrying the torch forward. Last Wednesday, Jan. 27, marked the fifth edition of Bell Let’s Talk, and Hudon used the day as another opportunity to open up on his struggles. Element and Hudon visited the Canada Cycle and Motor office, a company that specializes in sports equipment, and played hockey with the staff before discussing mental health issues. The two also made plans to talk mental health with a junior hockey team in Longueil. All the while, Hudon tweeted on different challenges he has faced throughout the course of his illness, including the need to tape the knob of his hockey stick “exactly seven times” before a practice or game, and keeping his desk 99.9 per cent bacteria-free. He has one simple message.